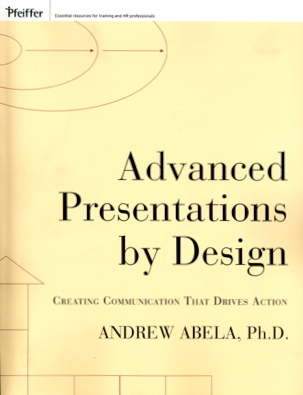 This new book on presentations takes a step by step approach and promises to make a presentation that will change your audience in the way they think and act. This “work book” is divided in 5 parts: metrics, logic, rhetoric and graphics. Each part has two chapters which together form the 10 steps in making a presentation: the 10-step extreme presentation method. It appealed to me since one of the premises is that you tend to build the presentation in a way that suits yourself best. We all have different learning styles. There are about 4 to 6 different learning styles and you tend to built the presentation for your own learning style hence neglecting others in the audience who use a different learning style. I tried the Beyond Bullet Points approach a couple of times for a presentation. A lot of work, a lot of fun but I now realize that this method made me present the material globally without much detail. Since it’s a “work book” and covers ten practical steps to make any presentation this book is comparable to beyond bullet points, also reviewed on this blog. Both books are mainly written for marketing readers but both of them include educational and scientific presentations as well. Advanced presentation has to my opinion the most appeal to scientist also because the author has based his method on research studies, an evidence based approach to presentations. In the survival guide for scientists you can also find some information about presentations but this excellent book mainly focuses on beginning scientists and covers a lot of more topics than presentations. These two books differ from Presentation Zen and Slide:ology, also reviewed on this blog. These two excellent books are mainly about the design of presentations and slides. Like beyond bullet points it also has a simple but effective way to built your story. Both are very much comparable but Advanced Presentations makes more use of examples. Beyond bullet points takes you more “by the hand” and has a very thorough built up of the presentation. Graphics are some what dull, no pizzaaas. The method is at the end of the book divided in two types of presentations: ball room presentations and conference room presentations. This division is not very well detailed in the book. The actual work making a presentation being a ball room or conference room is explained in just one chapter, a small part of the book. A ball room presentation is a presentation for an audience of 100 or more, I would put this down to 50 or 60. The author references this kind of presentations to Presentation Zen and as far as I am concerned Slide:ology. Conference room presentations are presentations according to this book with smaller groups. His advise is to create detailed slides and hand out for these kind of presentations. His book is mostly fitted to conference room presentations. I will have to find a mix of Beyond Bullet Points and this Extreme Presentation Method, will try it in the upcoming presentations. When to start Power Point for a presentation? Thanks for the review. I’ve heard about the book and wanted to know how it really was before I bought it.